We are in the process of developing an online Apprenticeship Course. It will be published as soon as available. 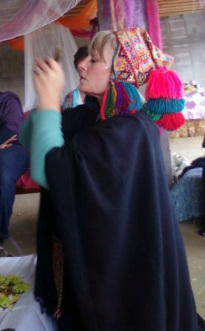 Nina Inti (Linda Jordaan) is a practicing Shaman and Kuraq Akulleq (Master/Teacher) Initiate of the Sacred Andean Tradition. Click here for more on Linda and/or her Teachers. Shamanism is a calling! When you are ready, you will hear its sweet voice and when this happens, it is time for you to heed its call. Shamanism is one of humanity's most ancient traditions that have been practiced by many, over centuries, throughout the world. Shaman work with energy and they use traditional methods for healing, solving problems and for keeping in harmony with nature, society and others. Traditionally a shaman is known as a person who can change their state of consciousness at will, in order to journey to other realms where they obtain knowledge and information for themselves and for others on request. The Shaman Within Course will be presented in various modules and over a number of months during each year. This will take place both in Cape Town and Johannesburg and facilitated by Nina Inti (Linda Jordaan). This Journey is one of Soul and is deeply personal. It is essential that you give yourself the relevant time for integration and growth, as you progress. During this foundation course the focus is on forming a close relationship with yourself and with nature in its many forms. This apprenticeship journey is a wonderful opportunity for personal empowerment through further potential growth and learning. The apprentice shaman is about you finding the Shaman Within you. It is a personal journey back to the Self and as such, would require you to do the necessary work in order to be the best you you can be in any moment. During this very personal spiritual Shamanic Journey you will be introduced to several of the core methods, philosophies and principles as practiced by Peruvian Shaman of the Sacred Andean Tradition, and Universal Laws. You will practically explore energy; energy bodies; it's interaction with your physical body, thereby facilitating personal healing; and discover and experience a deeper connection to other realms. Once you have completed your Paqo level and initiation you have a choice to continue along this path, or not. Should you choose to continue you will be learning much more around the Sacred Andean Tradition and Shamanism.